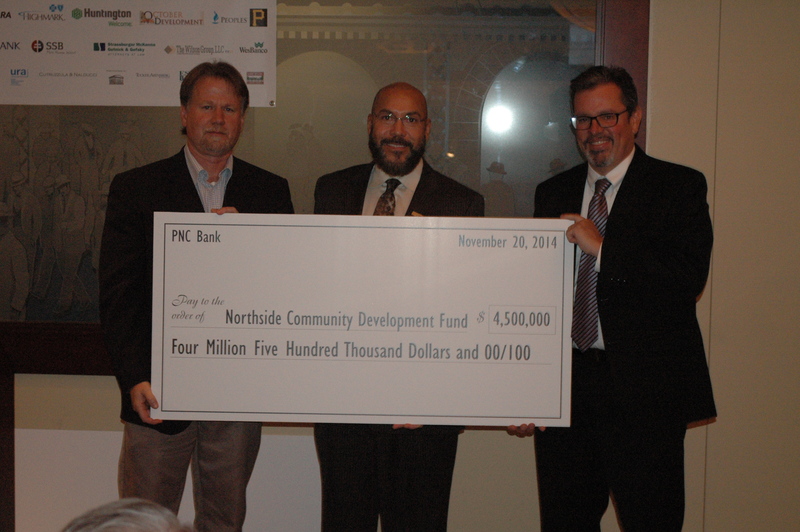 The Northside Community Development Fund held its annual Partnership Recognition luncheon Thursday, Nov. 20 at the Lexus Club in PNC Park. Over 200 people attended. Peoples Natural Gas CEO and president Morgan O’Brien (center) was the keynote speaker during the NSCDF annual Partnership Recognition luncheon Thursday, Nov. 20. The Northside Community Development Fund (NSCDF) held its annual Partnership Recognition luncheon Thursday, Nov. 20 at the Lexus Club in PNC Park. 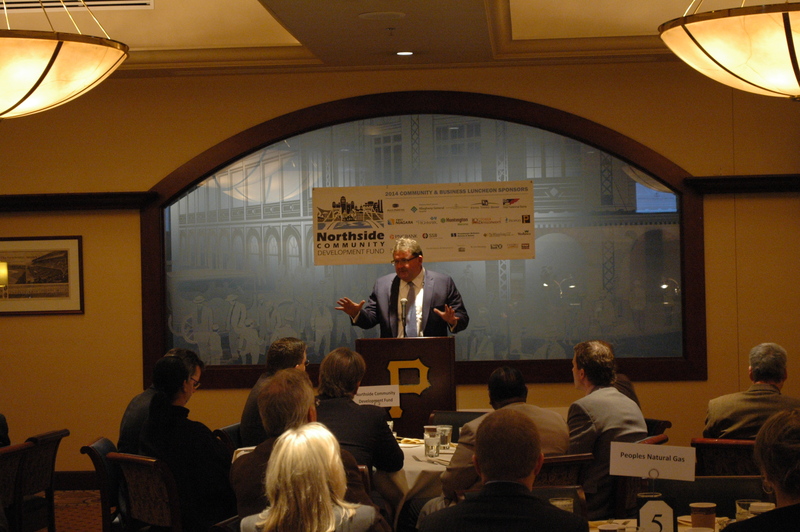 Peoples Natural Gas CEO and president Morgan O’Brien served as the keynote speaker as over 200 guests attended, including numerous Northside business and community leaders, local elected officials, and small business and community development lenders. Since 2000, the NSCDF has financed more than 200 Northside businesses and 18 strategic real estate projects, including providing acquisition funds for the recently announced redevelopment of the former ARC House site on East Ohio Street in Historic Deutschtown, and since 2006 has grown its loan capital base from $2 million to more than $14 million. Since 2006, 32 percent of the fund’s business loans and investments have been to minority-owned firms and 29 percent have been to women-owned firms. The fund accepted four checks that will help further its work on residential and commercial lending, including a $4.5 million check presented by PNC Bank. The check represented PNC’s $500,000 low interest loan and its $4 million investment in the fund’s New Markets Tax Credit subsidiary. With his office in North Shore, O’Brien cited the change in the business and professional landscape in Northside, citing more young professionals and companies moving to the area. Since 2000, businesses receiving assistance from the fund have created or retained more than 800 jobs. To learn more about the NSCDF visit the official website. NSCDF Board of Directors chairperson Bill Malloy (left) of ROAM Investments and NSCDF executive director Mark Masterson (right) with PNC Bank vice president, community development banking Joseph Foster at the NSCDF annual Partnership Recognition luncheon Thursday, Nov. 20.